Sparkle Overload with the Holidays? Feel like holidays are catching up to you way too fast? Feel like there aren’t enough hours in the day? Well we’ve got you covered! Blew now carries an amazing root touch up spray. Just a few spritzes where your noticeable roots or grays are showing and BAM you look like you just left your stylists chair. Colors range from the lightest blonde to the darkest brown. It washes right out once you wash your hair. With an easy fix for the holidays, you’ll have no worries about feeling beautiful! Dip into Our Fountain of Youth! Our incredible retail line, Kevin Murphy, has put out an immortal oil that you and your hair will die for! Young Again has the everlasting immortelle, which reverses your hairs age. It rejuvenates, mends, and makes your hair shine! It also has Bur Oil which gives your hair strength and body. This oil has a fabulous smell and all you need is a drop. Applying this oil to your hair either wet or dry can protect against heat and do so much more. It is truly a magic potion!! You can also combine the oil with the Young Again Wash and Rinse for complete restoration. Separately or as a trio, they'll surely give you shiny, frizz-less and youthful looking hair. Come dip into this fountain of youth! With the lack of snow on the ground, and the days being cold and grey... you might be getting stuck in the winter ‘blues’. Maybe you're feeling blue because you're not feeling Blew! Maybe it’s time to change that hair up?!? Blew is always trying to find the newest hair trends to give you the ‘wow’ factor! At the end of January we will be going to a class that will teach us the newest form of highlights called Balayage. It’s a new way to wear your hair color. you paint and sweep it onto your hair without the help of foils. The idea is to create a very natural look, almost like what you had when you were a small child.Think painted, soft, subtle, organic! It's a the leading hair trend and we're bring it to Blew! We are very excited to learn this new technique, so call schedule your balayage appointment. And if dying your hair isn’t your thing, bring in a photo of a new funky hair do that will spice up your life. From the beginning of this summer we have fallen in love with a new shampoo and conditioner that you might have heard us rave over. We still can’t stop talking about it even with winter chilling our bones. We brought Jellua’s Squid Ink Shampoo and Conditioner into our family of products and now we can’t let go. Evolve is the company that supports Jellua and we want to grow with them. With that being said, we are very excited to announce that we will be saying “Bon Voyage to Aquage” and bringing a slew of new products!! Kevin Murphy, Loma Organics, Jellua, and Hair Moringa are some of the new and super amazing products that we will be dressing your hair with. Kevin Murphy isn’t any ordinary line, it’s an extraordinary line. Its high end, super green and the creator, Kevin Murphy, is a celeb stylist. Kevin murphy has put a lot of thought and time into what he has created. One of the best parts of the Kevin Murphy line is that each bottle and cap is very eco and green friendly. All the packaging is recyclable or biodegradable and harmless to the environment. Kevin Murphy himself has spent a lot of time to make sure that his products are cruelty free. PETA has approved and stamped the cute little bunny on the products. These products aren’t a ‘one size fits all’, they are specialized for each textured of hair. Which we love because we want to focus on that head of hair and give it the TLC it needs. We are very excited about this change, and we know that our clients will love it as well! Expect to see these amazing products hit our shelves in the next week!!!!! Check out Kevin.Murphys website and learn all about his line and how much he cares about the environment!!! The golden rule to keep your hair healthy is not to wash it every day. That’s right, washing your hair every day is actually doing more damage than what you think. You may be thinking to yourself that your hair may become greasy right away and look unpresentable but we have a secret weapon for you… Dry Shampoo! This will be your best friend; you will love it and want it by your side all the time. You simply spray it onto your roots, shake it around and it will absorb the oils in a flash. We sell an amazing and affordable dry shampoo, TIGI Rockaholic Dirty Secret Dry Shampoo. You should give it a chance, it may be hard to change your hair washing routine but it will benefit you and your hair in the long run. Autumn is for jumping into a big pile of weaves! With the leaves starting to change, you may feel inspired for a little change as well. Blew has the perfect recipe to satisfy that urge…. Aqua Tape-In Extensions!!! We have been obsessed with these extensions for the past year and have been able to create amazing color transformations without any permanent altering. The fabulous part about these extensions is how they fit into your life so easily! You can still straighten or curl them; they act just like real hair… because they are! They’re made from the finest remi hair. The process of putting them in is easy as pie. We simply take a strand of your hair and sandwich it in between 2 pieces of the extension and that’s that! It can’t get any easier, though taking them out is just as effortless. We have a gentle adhesive remover that makes the tape slip right out without damaging your precious hair. All three of our hairstylists are qualified to put them in, so call us today and start the fall right! Fishing for a New Product?!? WE INKED OURSELVES! Blew has been inked! That’s right kiddies, we have an AMAZING new product line that has SQUID INK in it! Squid ink is naturally loaded with amino acids that keep your hair, long, strong, and frizz free. A Japanese line called Jellua, which means “it is the best”. The amino acid in this stuff forms building blocks for your luscious mane and keeps it super duper shine! This shampoo also tingles and cleans your hair and scalp of any bacterial or stinky issues! It’s gluten free, cruelty paraben free, and most importantly sulfate free! Seriously people; this shampoo can benefit almost everyone! Come in as ask to be INKED! Going green has been a part of our culture since day one. We are now carrying Organic Color Systems! This line is amazing and great for those who want to go ‘green’ with their hair. OCS is a certified organic, vegan and most importantly, ammonia free! One of the best parts of this permanent color line is that it covers resistant grey hair 100%! The Organic Color System provides a wide variety of vibrant colors and has long lasting coverage with a fabulous shine. We strive for excellence, so we promise this organic goodness will be beneficial to you! Call us today at 203-874-2360 and make an appointment with one of our stylists! Here at Blew we are very excited for the future! With our 1 year anniversary just around the corner, we are ecstatic to see how much we have grown and expanded. Marc and Courtney have been Rockin ‘n’ Rollin and we are very excited to announce that our Master Hairstylist, Kristine Livolsi, will be opening up her schedule a little more. She will now be here Tuesdays, Thursdays and Saturdays! Kristine is very excited to get back to her natural groove and to be a stronger part of the Blew Crew. For anyone interested in booking an appointment with her, give us a call! You’ll fall in love, organically! Call today at 203-874-2360 and ask for Kristine! Dont you love, at the end of a long beach day when your hair is at its best? With the salty wind and water running through your hair, giving you the perfect beach waves, you're a total beach babe! As much fun as it is to go to the beach, you may not be able to have time for all that fun. Here at Blew we have the perfect product for you; the Aquage Sea Salt Texturizing Spray. This is a very lightweight spray that gives you that great beachy look without cathing those scary UV rays. You simply spray it in after you have washed and conditioned your hair, towel dry and bam! Let it dry natural for that scrum-diddly-umptious mermaid look. Come on in today and pick up your new best friend. With summer in tow, you are probably dreading the frizzy, unhealthy summer hair. Well here at Blew we have exactly what you need to have a bright summer ahead of you. One of our specialties is a Keratin Treatment. The Keratin Treatment works by coating the hair strands in keratin; replacing the broken protein bonds and strengthening the hair by adding an additional layer of keratin. Our treatments soften and smooth the hair strands, removing 100% of frizz and transforming broken hair into manageable, shiny locks. Call us today to step up an appointment for your beautiful mane. As the season changes over to summer your hair is going to be put through some stress. Before the humidity and the beating sun starts up, give your hair some TLC. Here at Blew we recommend this great at home remedy. The best part of this hair recipe is that you can find the ingredients right in your own kitchen, all you need is baking soda and either white or apple cider vinegar. The first part of this process is the baking soda. You want to take 2 or 3 tablespoons of the baking soda and about 3 times that of water; you want to make a paste like texture. Rub it throughout your hair and let it set for about 4 minutes. Rinse it with cool water and you are ready for the apple cider vinegar! After you rinse the paste you will want to mix 1 part white or apple cider vinegar with 4 parts water. A good idea to keep the stink of the vinegar out of your hair is to mix in a little lavender. This way your hair will look beautiful and smell delicious. Run it throughout your hair and be careful to not get any in your eyes! To finish rinse with cool water, the cool water will hold in the moisture in and give you a great shine. Follow these steps so your summer will start out with stunning hair! Read out last weeks blog on how to maintain your hair during the summer. After you finish with this home remedy, call Blew today and make an appointment for a fresh new hairdo! How to out shine the sun; follow these tips. As much as we love summer, summer isn’t always our friend. From the sunshine, to the chlorine, to the humidity; our hair is being damage throughout the season. Follow these tips and you will have gorgeous healthy hair once fall starts. 1) Make sure you have a good conditioner! With the brutal summer heat, your hair is bound to dry out. Give your hair some love in the shower and buy a nice moisturizing conditioner. A great conditioner that we carry in the salon is the Moisture Conditioner by Biomega. This conditioner is great because it helps with frizzy damaged hair and gives it a healthy shine afterwards. 2) When going swimming in the pool try putting a leave-in conditioner in your hair. This is a good way to protect your hair because your spongy locks are soaking in the chemicals and drying it out. 3)Try going for a natural beachy wave look this summer. With the harsh heat your hair doesn’t need any more heat added to it. Leave the blow dryer and all the heating tools out of your routine this season, and try our Aquage Sea Salt Texturizing spray. 4) Last but not least remember your ends; they need some TLC as well. With all the damage it’s being put through your ends will split a lot quicker. Trim them every 8 weeks so at the end of the summer you have beautiful luscious hair. Here at Blew we carry many products that can help you throughout this season. One of our product brands, Aquage has a line called SeaExtend which has a Thermal-V Complex and this helps block out heat and with the sun beating down onto you these products will help you out. One of the products, the Silkening Oil treatment, is a great little pick me up for your hair. It helps restores moisture and gives you a nice shine; it’s also locks in your color for a longer lasting result. Come in Blew today to get your essential products for this summer. Need a fun night out? In a week, April 9th, Blew will be involved in a great event that will be donating all the proceeds to Locks of Love. Hair Fever is a fun little competition where 9 different salons will be showing off their fabulous hair creations. Please come down to Marisa's in Trumbull to support us and this great cause. You can buy tickets at the door or stop by the salon ahead of time. Tickets are being sold at $20 and the show starts at 8 p.m. Get there early with all your friends for a great dinner and seat. The biggest no-no of the year is 'do it at home' box dye. We all know how easy it is to do; go to your local grocery store or drug store, pick up a box and have it done in 45 minutes. But have you ever thought about how box dye is the wrong route to go? Box dye is "one size fits all", there's no uniqueness or personality to it. You also need to be careful because some box dyes contain ammonia which can be very damaging to your hair. And when you go to a hair salon you know that its properly being put on and you know the turn out will look amazing. Make an appointment today with a real hairstylist who will whip up the color of your dreams. Here at Blew we are loving this new trend. It brightens up your face and its a very low maintenance look. Many celebrities like Sarah Jessica Parker and Jessica Biel are obsessed with this look. Very similar to the ombre, which was a hot rage a year ago, your roots are darker and look grown in and has a more of a subtle highlights. Be sure to like us on Facebook and follow us on Instagram for daily updates! You know winter is here when your scalp begins to get dry and you start to get dandruff. Here's a quick tip to managing your dandruffie hair in this frigid weather. Wait 10 to 15 minutes before you do your regular shampoo and conditioner. Mix 4 tablespoons of lemon juice to a cup of water and use this last step as your final rinse. Use this natural remedy a couple times a week until your dandruff is completely gone. Other natural secrets are aloe vera, apple cider vinegar and tea tree oil. Start the new year with the 2014 trendiest hair style. Short and sassy is what its all about this year. Make sure to like us on facebook and follow us on instagram for the daily up dates. 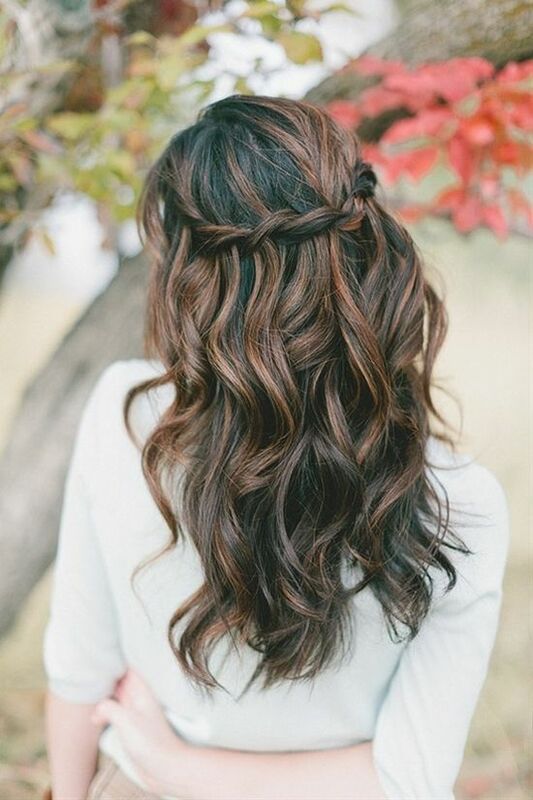 We are just loving these ombre tousled waves with the ultra trendy braid! Marc & Courtney are dying to replicate this style! Book an appointment today! 203.874.2360 ! Be sure to follow us on Facebook and Instagram for daily updates! Blew is a full service hair salon specializing in Blow Drys, haircut, color, highlights, foil, ombre, wedding & event hair and makeup, updo's. Traveling hair and makeup services available.